The top tape among the joint sealing tapes. Joint sealing tape of polyurethane soft foam with acrylate dispersion impregnation, accessory agents and filling agents. For sealing directly weather-exposed joints in facade and window construction. 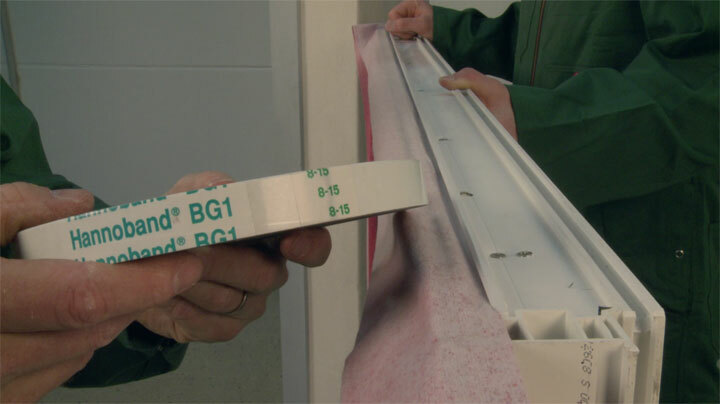 Anyone favouring construction joints with long-term perfect sealing will select Hannoband® 600. After an outdoor weathering test MPA Hannover confirmed that Hannoband® performed clearly better than the requirements of DIN 18542:2009 even after 15 years in the joint. Hannoband® 600 can be put to universal use for the sealing of joints in structural engineering. The preferential areas of use are window construction, wood construction, prefabricated construction and masonry, frame-work construction and concrete construction. Hannoband® 600 especially provide advantages when it comes to sealing connection joints and expansion joints between various building components and when sealing foils in roof extensions so that they are windproof. Hannoband® 600 are especially used in interior work for the sealing of connection joints due to its good sound insulation values. Hannoband® 600 on the roll can be put to universal use and can also be inserted in existing joints due to the precompression. * DIN18542-BG1 requirements are met. Click on application instructions for the use of Hannoband 600 joint sealing tapes. Click on technical specification for Hannoband 600 window joint sealing tapes.